I just had to do something to warm us up and remind us of the summer. 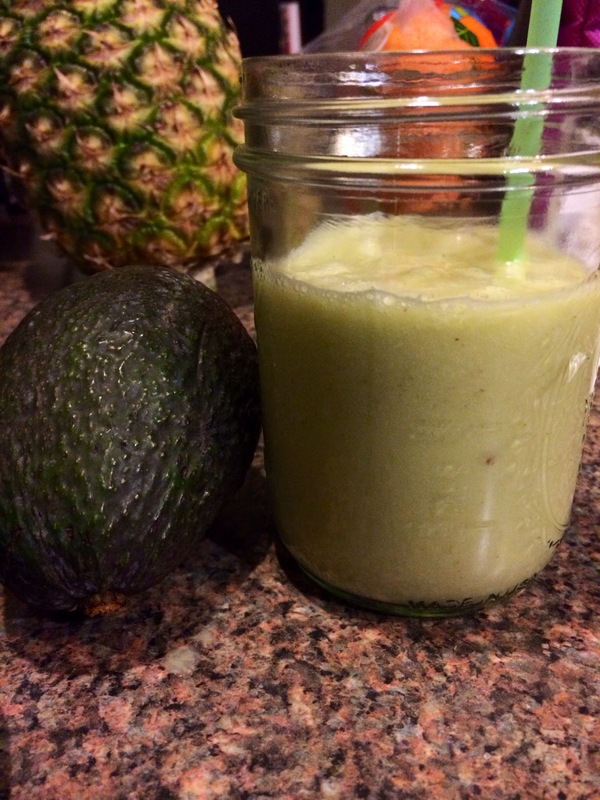 For our snack, I decided to make this awesome smoothie that I had tried during our Food Lover’s Cleanse. 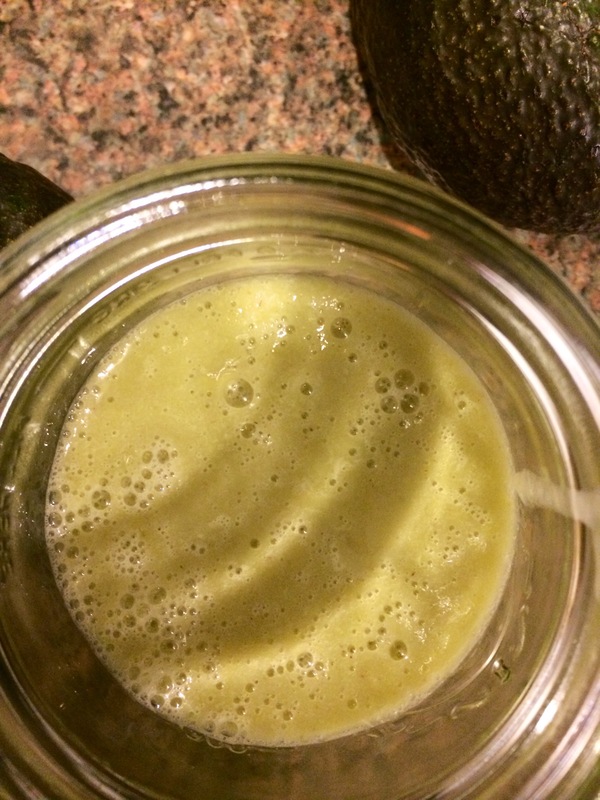 This avocado smoothie is light and refreshing, and I loved using Coconut Water instead of milk or yogurt. It might sound weird, but try it! 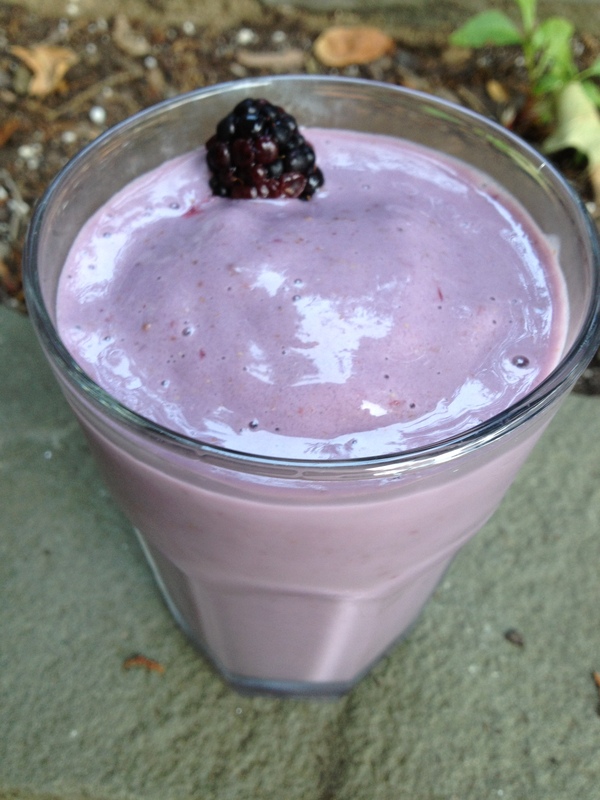 It’s delish and even dairy free! 1. Combine ingredients into a blender and puree until smooth. 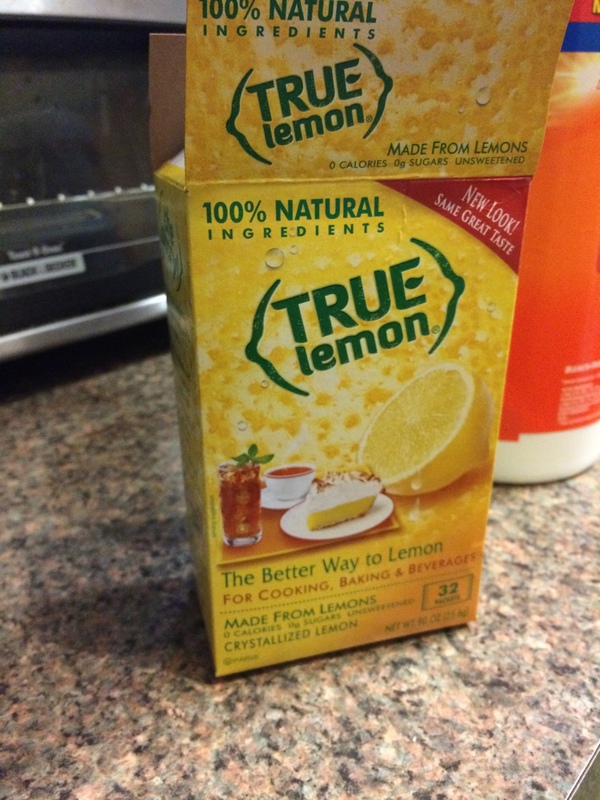 Add extra lime juice to taste. 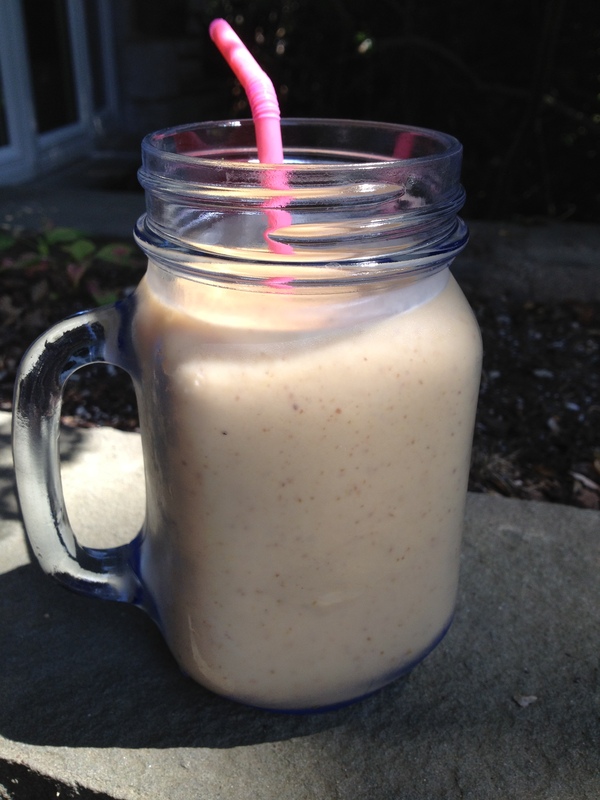 Try some of my other smoothie recipes! Okay I finally gave into the “Green” Smoothie madness. 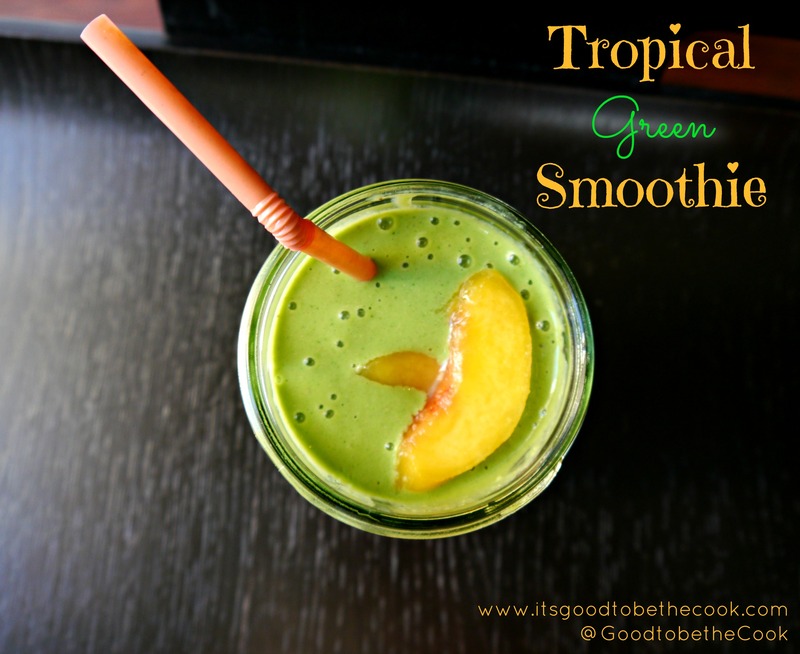 Everyone everywhere has been all over Green Smoothies for a while now, and I have been way too intimidated and freaked out by them to try. Oh yeah… I’ve also been too freaked out by Kale to give that a whirl too. My boss’s wife convinced me to try to make Kale Chips (if he eats it I know it has to be good)… which was a huge disaster. They were either burnt or wet and not crispy. They tasted bitter and chewy. I think I actually gagged on a piece before I tossed the entire tray. Gross. Fresh Kale! 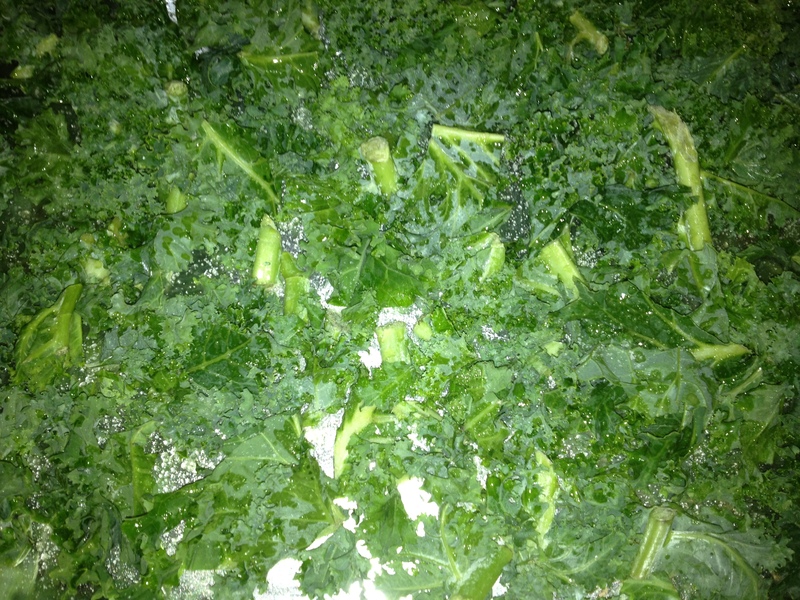 My failed attempt at Kale Chips. Low in Calories/High in Fiber/Zero Fat, Iron, Vitamin K, Antioxidants, Omega 3’s, it can lower cholesterol, it’s high in Vitamin A, C, and Calcium, and finally… it is known to be a great “detox” food. Good for your diet, prevents cancer, anti-inflammatory, antioxidents, lowers blood pressure, it is good for your immunity, skin, bones, and vision, and the Vitamin K in it helps the process of calcification and brain and nervous functions. Whew! All of this healthy green talk has got me wanting more now! 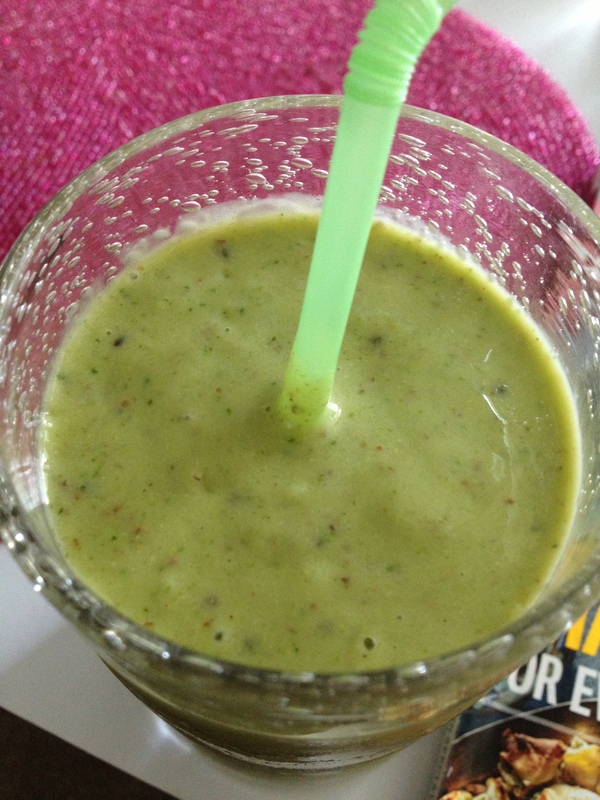 I like to put my fresh fruit first (banana and kiwi) into the blender. Then, I put the frozen fruit, yogurt, and juice. Top it off with the spinach. 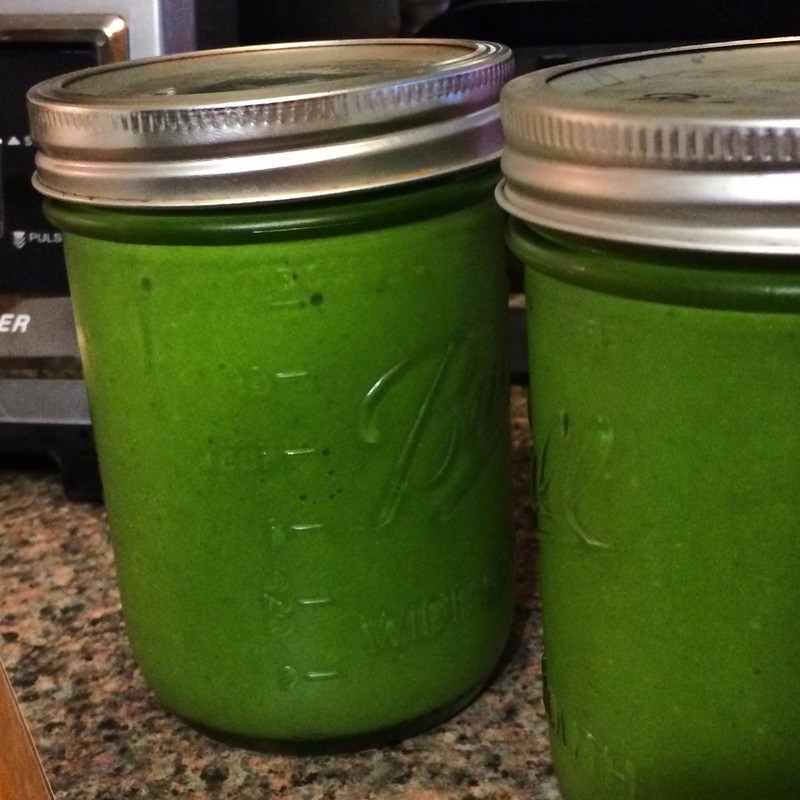 It took about 30 seconds or a minute of blending for the spinach to make its way down into the smoothie. 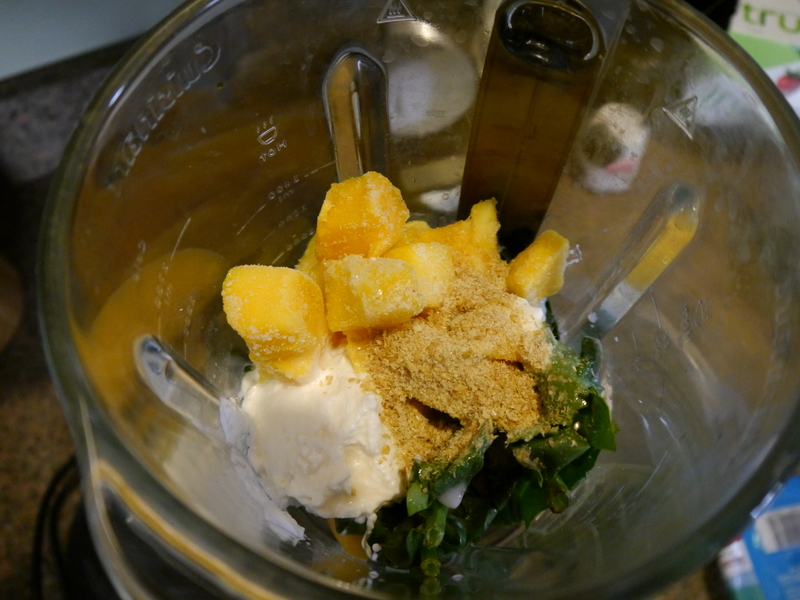 Blend for another minute or two or until the spinach is broken up in the smoothie. Enjoy! 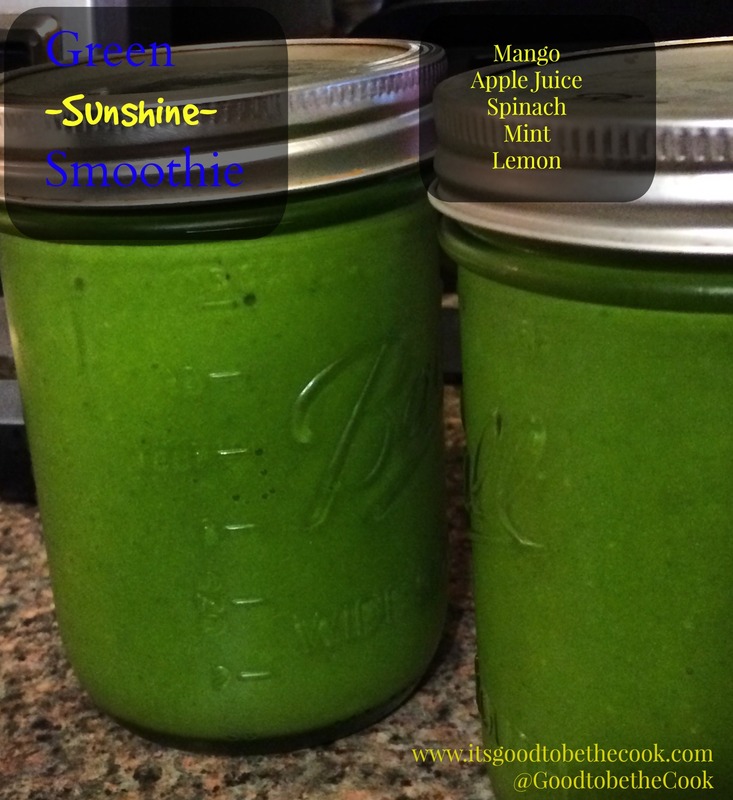 Smoothie Sunday… I think I will! Sippin’ my smoothie and readin’ my Rachael Ray… LOVE Sunday Mornings. Okay, so the results were great. I really liked it! 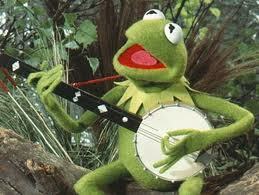 I like to surprise myself sometimes when I try things I think I’ll hate but end up liking them. 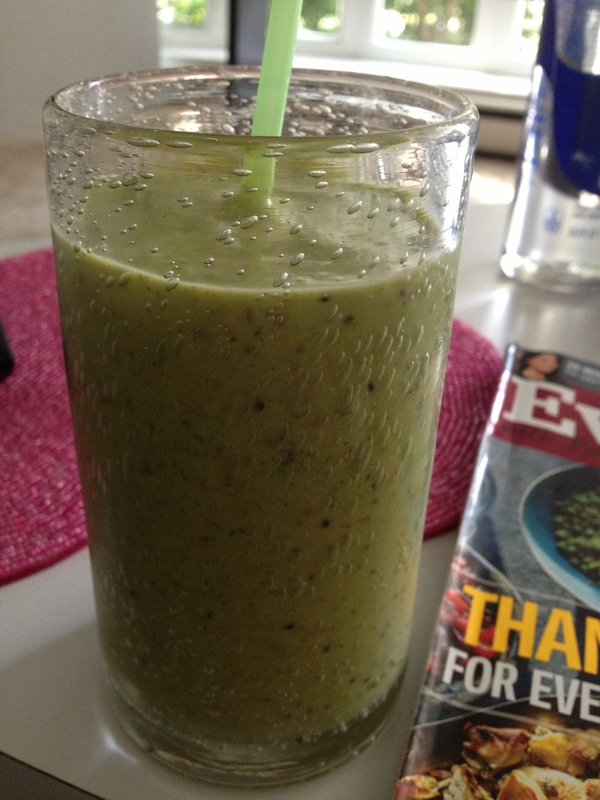 This was one of those times… now I know why everyone’s doin’ the Green Smoothie thing. It’s great! While I’m talking here, my co-worker Lori came in and shared a sip of her Kale Smoothie with me… I like those too! 🙂 Thanks Lori! So, I am VERY into making smoothies lately. I love drinking them as a snack or breakfast after working out. They’re so refreshing! 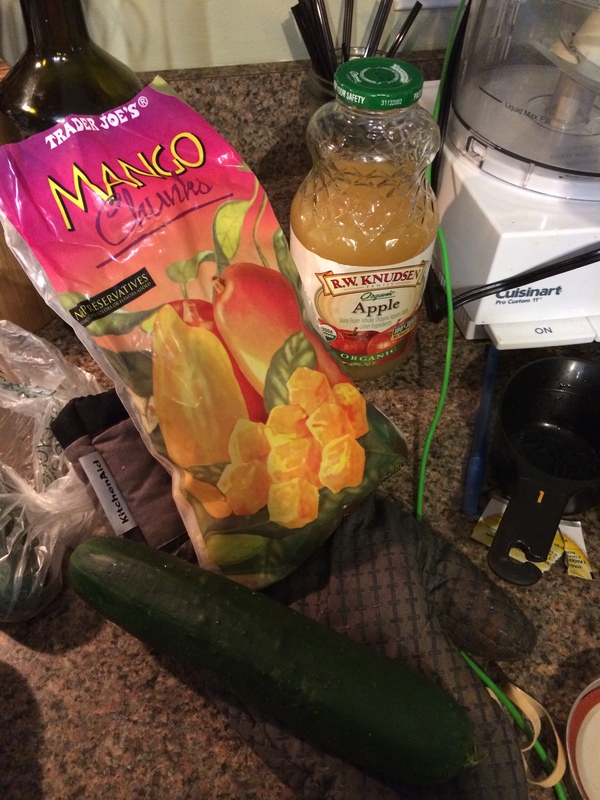 This weekend, I made a really awesome smoothie that was much different than the last two i’ve made… here and here. So, I bought a giant watermelon last week from Wegmans, against my better judgement. I LOVE watermelon but no one else in my family will eat it. Sure enough, I cut up half of it (only 1/2 because I ran out of Tupperware! ), ate it all, and now was left with a whole other half of a watermelon. 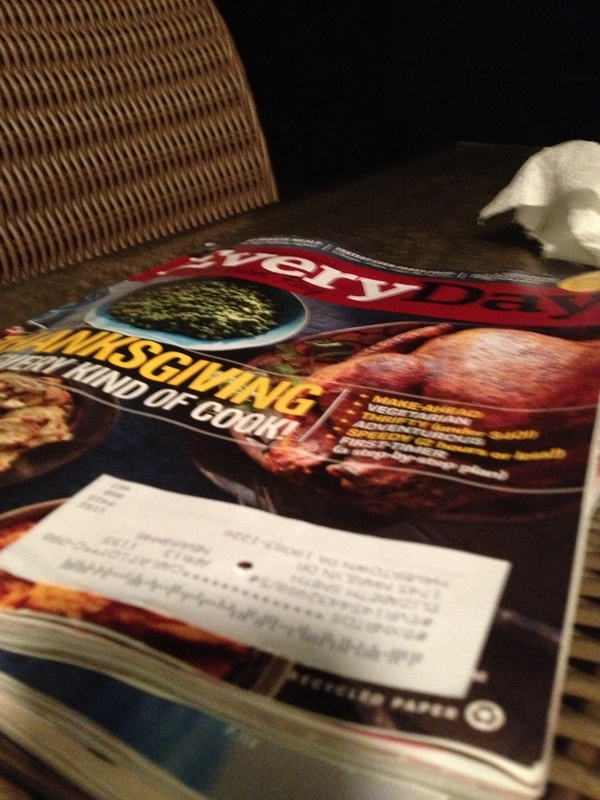 Not having any immediate use for it, I decided it was a smart idea to cut it up and freeze it. SO… I guess I wasn’t thinking because I froze it all in a huge gallon freezer-bag… and it all stuck together! DUH. After hacking at the watermelon brick for a few minutes with the end of a knife, I separated some of the pieces and made this milkshake/smoothie for myself after the gym on Wednesday. 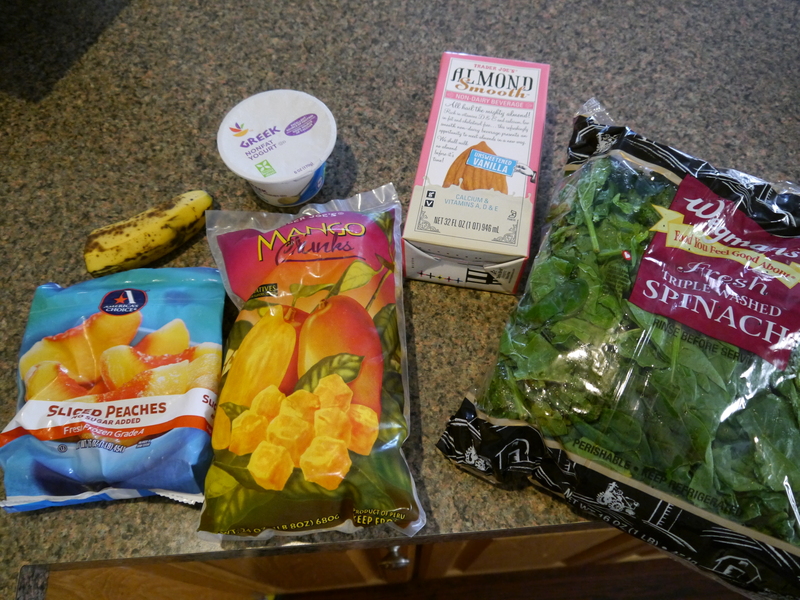 I really enjoy smoothies while I am cooking dinner, since I’m always so hungry when I get home. I know it’s healthy and I know I’ll still have an appetite when I’m done. The other good thing about it is that there is an end to it… as opposed to snacking on a big bag of pretzels or chips or even crackers… I just keep going! 1. 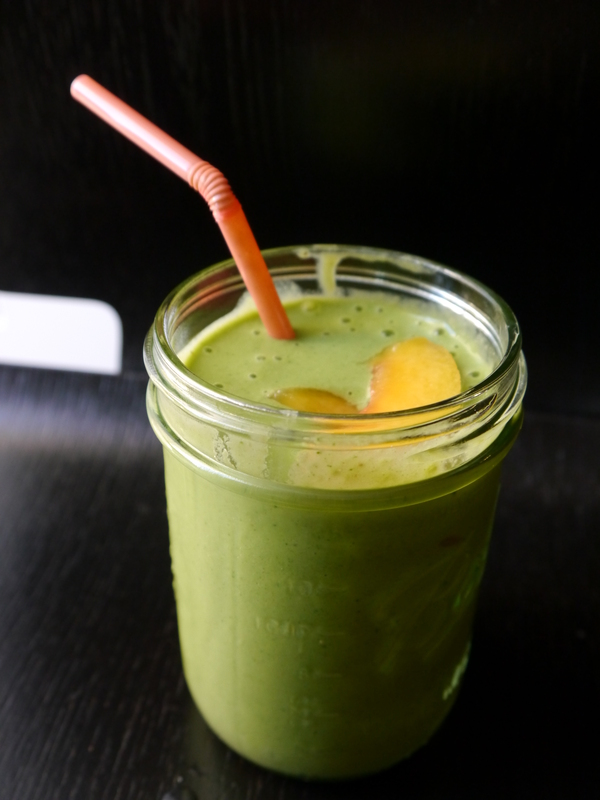 Combine everything in a blender and ICE CRUSH! – or any other speed… I just like that one! 2. Add more milk if it needs to be thinned out. I started with a Tablespoon and had to add more. Also, I had to stop and stir it up a few times before the blender got goin’. This recipe was yummy but the watermelon flavor wasn’t as strong as I was hoping. I think this is because the actual watermelon wasn’t as sweet as they normally are. I’d really like to try to add frozen watermelon next time to see if that would help!